Over the past several weeks, I’ve been working in a handful of different locations (various offices, at home, in the library, etc.) During this time, I’ve grown increasingly aware of how drastically the environment influences my productivity and concentration. I mentioned this observation to a colleague the other day, and it turns out that she has a similar experience when shifting from her home office to her work office. Inspired, I reached out to a friend who specializes in interior office design. I wanted her two cents on the relationship between environment and productivity, and she reinforced my observations immediately. 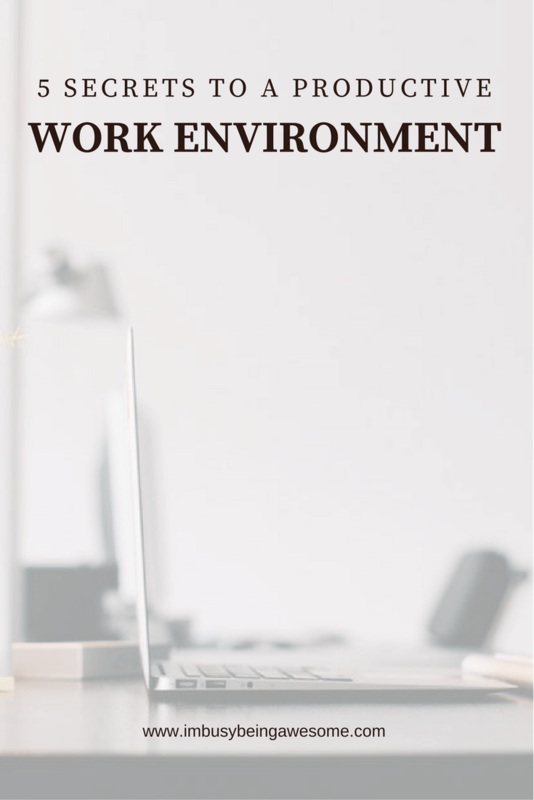 It turns out, even slight changes in the environment can have a big impact on a person’s work. We chatted for a while about this idea, and she mentioned some easy strategies for creating an affordable, comfortable, and productive workspace. Obviously, I had to share these tips with you. Are you ready for it? One of the biggest pieces of advice that came from our conversation, is to have a large surface where you can spread out. Seriously, it’s as simple as a flat table. Often times, we think the “ideal desk,” with built in shelves, filing cabinets, and all the bells and whistles, is the key to productive work. But more often than not, a simple table with plenty of surface space is all you need. If your office space is limited, there are plenty of smaller, table-style desks as well. They’re easy to put in a corner, which (bonus!) also maximizes your office space. In this situation, however, it’s even more important to keep that surface clutter free. The more space you have, the easier it will be to spread out and dig into your projects. For those who don’t have a designated “office space,” your dining room table (provided that it’s in a quiet area) is a fantastic option. In fact, my husband spent 3 years working at our dining room table in our last apartment. He loved it. The second piece of advice for creating a productive workspace is comfort. Remember, you need to sit (or stand) in this location for eight hours a day. So as you create your ideal office environment, make sure comfort is a priority. Doing so will put you on the fast track productivity in no time. 3. Keep Everything In Its Place. As Gretchen Rubin wisely states: outer order contributes to inner calm. And let me tell you, this is especially true in an office setting. Speaking from personal experience, when I’m staring down a particularly challenging task, it’s much more appealing to simply “straighten up my desk,” or “file some papers,” than dive into the project at hand. Especially when I’m feeling overwhelmed. Knowing this about myself, I try to to put everything away at the end of each day. Books go back on the shelf. Pens and pencils return to the drawer. And papers get filed. This way, when I return the next day, my office is clean, and I’m distraction free. If you can relate to the clutter stumbling block, try thinking about what kinds of organizational tools you need to keep your space clear. And as you consider, be as specific as possible. From multi-port charging stations (seriously, this thing is intense) to more traditional desktop storage, there is an organizer for everything. Bookshelves, a simple desk tray, and a few filing cabinets for student assignments are key for my office. I’m definitely one of those people who loves office supplies and fun, stylish storage. So if I can make my office both visually appealing and clutter free, it’s a win-win situation. The fourth piece of advice concerns lighting. To risk sounding dramatic, lighting is the unsung hero of your workspace. In fact, a study conducted by the American Society of Interior Design found that 68% if employees complain about lighting in their office. And the two biggest problems were harsh lighting and dim lighting. As Andrew Jensen explains, both harsh and dim lighting make it difficult for eyes to focus, and can also lead to headaches, eye strain, and a general drop in productivity. Of course the best solution to this problem is natural light. If possible, choose a workspace where natural light pours in for a quick increase in energy and motivation. If your room doesn’t have much natural light, that’s okay! You can still reap the benefits. How? Try hanging a mirror opposite your window. This way, the incoming light reflects back into the room, which simultaneously increases the brightness and makes the space feel larger. Yay! To establish your workspace with lighting, simply use a light to illuminate your specific work area. Hang a pendant light over your desk/table, pop a stylish desk lamp on your tabletop, or have a floor-standing light that points directly at your station. By delineating your workspace through lighting, you create your own personal “office atmosphere,” even if you’re sitting at your dining room table. The final tip to creating a productive work environment is to make the space your own. And you can achieve this is so many ways. You might incorporate your signature color or surround yourself with motivational quotes. Think about the art you can hang over your desk or which pictures you might frame from last summer’s vacation. In other words, take some time to personalize your space. Make it a place you want to work, and watch your productivity soar. And there you have it! 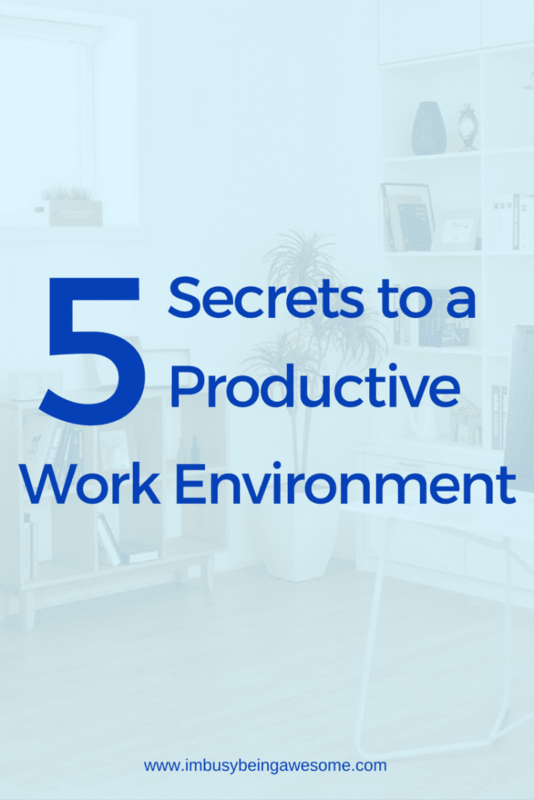 The 5 secrets to a productive work environment. So tell me, is your productivity impacted by your surroundings? What helps motivate you? What’s the number one organizational tool you need in your office? Let me know below! 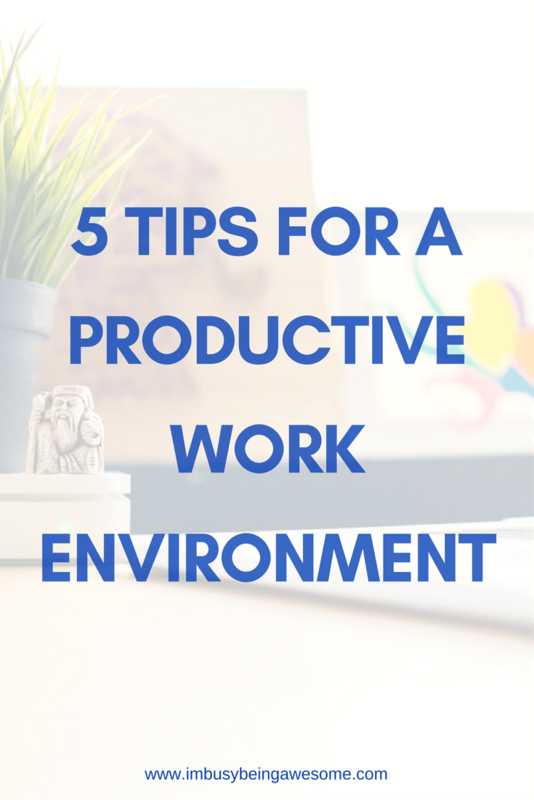 These are definitely the keys to a productive and inspiring work environment! I often forget how crucial lighting is. In my current office, I only have overheard fluorescent lights, but I’m grateful for this reminder to grab a few lamps. I think they would really transform that space! You are so bang on with all of these! I totally agree. Especially comfort and lighting! My workplace is sacred and I make sure I have cherished things around me. Comfort and color are key to my workspace. I couldn’t function in a cold, bare workspace. Great tips! I completely agree, I think the environment definitely affects creativity and productivity! Yes! It’s amazing how much it does. I love these tips! We don’t have a designated office space and sometimes I feel most productive sitting at our big, cleared, dining room table. these are such good tips! I’m actually redoing my office over Christmas! I think it helps to have your own separate space. Lighting and organization is so important, as well as having your space decorated! I think it helps you stay inspired! Yes! You have to love your space, otherwise – as you say – it’s uninspiring to spend so much time there. Excellent post – I have a lovely office but often work at my kitchen table – it’s a lovely feeling to be in that room.